This article describes how to open, save and close all types of files that cannot be edited within Content Station itself: meaning all files except InCopy articles (when not opened in Content Station itself), HTML articles and plain-text articles. For information about opening, saving and closing InCopy articles (in Content Station), HTML articles and plain-text articles, see Opening, saving and closing articles in Content Station 9. This article describes the workflow of opening, saving and closing files using Content Station AIR. 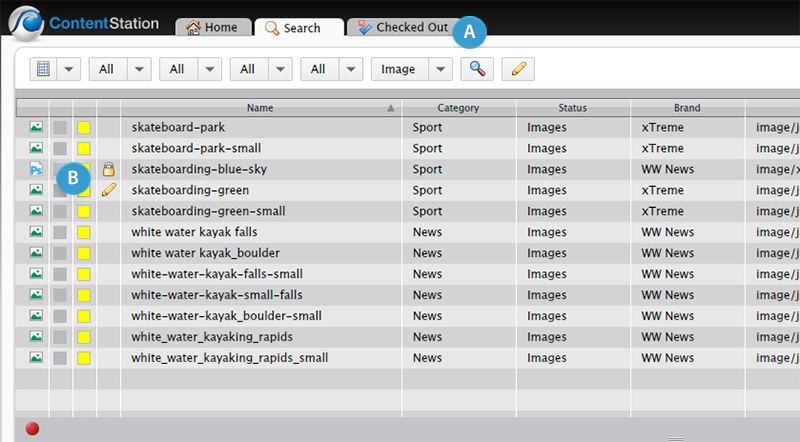 When using Content Station Web, see Opening, saving and closing files with Content Station 9 Web. Content Station allows you to open any type of file for editing it in its own application. After editing the file, it can be saved back to Enterprise. Example: You can open a Photoshop file from within Content Station, edit the file in Photoshop and save the changed version back to Enterprise. In order for this feature to work, Enterprise will have to be configured so that it knows which application to use to open the file, where the file is temporarily stored on the local system and after which time period Content Station should check wether the local file has changed. For more information, see Configuring the opening of files outside of Content Station 9. The file is saved to a default location. The file is checked out of the system. As long as the file is in this state, other users are prevented from editing the file. An icon appears in the 'In Use By' column of the Document pane for the file: a yellow pencil for you as the user who has checked out the file, a yellow padlock for all other users. A Tab titled “Checked-out” is displayed, listing all files that are currently checked-out by you. If the Checked Out Tab is already shown, the file is added to the list. The file is automatically opened in its own application. The file is saved to a default cache folder on the system. The file is not checked out: no icons appear in the Document pane and other users can still open the file for editing. Tip: Use this method to open a file that is stored in Enterprise as the starting point for a new file. If needed, the edited file can be uploaded to Enterprise as a new file. Note: The file is saved to a cache folder and automatically deleted as soon as Content Station is closed. If you want to maintain a local copy of the file, save it to a location of your choice. You are asked to choose a location where the file should be stored. A Tab titled “Checked Out” is displayed, showing the file that is currently checked-out by you. If the Checked Out Tab is already shown, the file is added to the list. The file is not automatically opened in its own application. 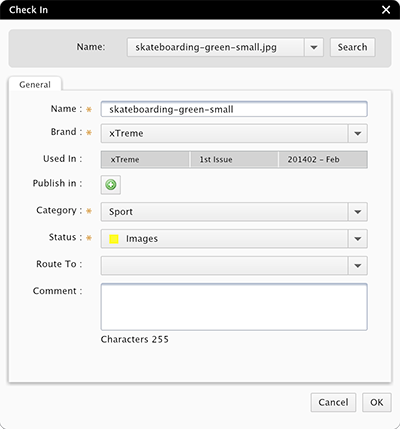 Figure: Checked-out files can be recognized in Content Station AIR by the presence of the Checked Out tab (A) and the presence of icons in the Document pane (B). The Checked Out Tab shows all files that you have checked out. It is used for closing and/or saving the files back to Enterprise. Figure: The Checked Out Tab. One useful way of using the Checked Out Tab is to quickly open any of the checked-out files from it. Do this by double-clicking a file in the list to open it in its own application (or return to that opened file if it is already open). When editing a checked-out file and subsequently saving that change, the change is saved on the local system. The content of the file is now different from the original file in the Enterprise system. The title in the Checked-out Tab will display in bold and will list the total number of changed files in brackets. 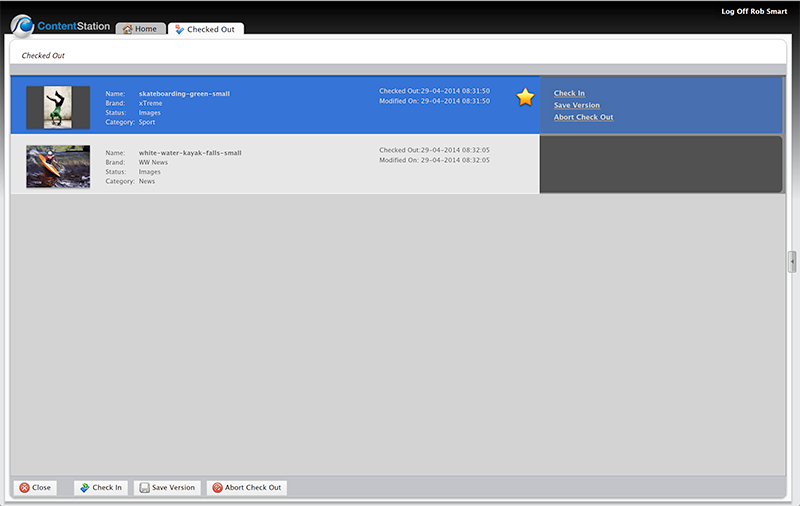 A yellow star is displayed in the Checked Out Tab for each file that is changed. Step 1. Return to the Checked Out Tab in Content Station. Step 2. Select one or more files for which you want to save a version in Enterprise. The Save Version dialog box appears. Step 4. (Optional) When multiple versions of the file exist in different file formats, choose the file format that needs to be saved from the Name list or use the Search button to search for a version of the file stored elsewhere. 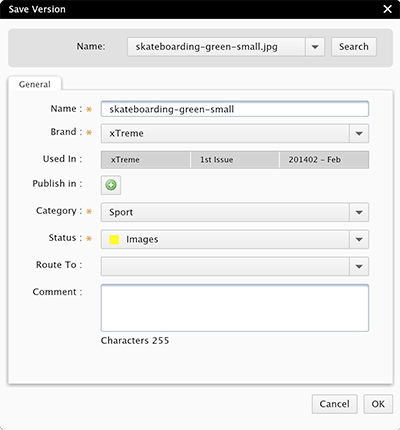 Tip: To see the path where the file is stored, hover the mouse over the name in the list. Step 5. (Optional) Fill out the remainder of the file properties in the dialog box as needed. During this process, a new version of the file is saved to the Enterprise system. Step 7. Return to the file in its opened application and continue working on the file. Saved file versions can be viewed and restored by accessing the Show Versions window (File > Show Versions...). This means that when the maximum number of stored versions is reached, the oldest version is removed the next time a new version is saved. This could potentially mean that the version you want to restore may not be available anymore. Be careful therefore with the number of times you save a version of a file. When you are finished working on the file it needs to be checked-in. This saves the made changes to Enterprise and makes the file available for other users to edit it. By using the Check In dialog box. Use this method when any of the file properties need to be changed. By not using the Check In dialog box. Use this method when you know that the name or properties of the file do not need to be changed. This method is known as a 'silent check-in' because it does not display the Check In dialog box. Step 1. (Optional but recommended) Close the file in the application in which it was edited. Step 2. Return to the Checked Out Tab in Content Station. Step 3. Select one or more files that need to be checked-in. In the Checked Out Tab, click Check In. In the Checked Out Tab, click Close. Note: Using the Close button for checking-in a file only works when the file has been modified; if the file has not been modified the Close button will act as an Abort Check-out button. Step 5. (Optional) When multiple versions of the file exist in different file formats, choose the file format that needs to be saved from the Name list or use the Search button to search for a version of the file stored elsewhere. Step 6. (Optional) Fill out the remainder of the file properties in the dialog box as needed. The file is checked-in and closed. It is now available for other users to edit it. The file that was temporarily stored on the local system is automatically removed. Note: Using the Close button for silently checking-in a file only works when the file has been modified; if the file has not been modified the Close button will act as an Abort Check-out button. By checking-in the file. See Checking-in the file and closing it above. By closing the file without saving any last-made changes (known as an 'Abort Check-out' action). See below. Use the Abort Check-out feature to close the file without saving any last-made changes. Note: Any versions that were saved after checking-out the file are maintained in the system. Example: You have checked-out an image, saved an intermediate version of it, and continued working on the image. When performing an Abort Check-out action, the last made changes are discarded but the previously saved version is kept in the system. This method is typically used when opening a file by mistake, quickly checking the content of the file without having to work on it, or realizing that the file does not need to be edited. Automatically: locally stored files are automatically deleted. This method is known as a 'silent check-in' because it does not display any dialog boxes or windows. Step 3. Select one or more files that need to be closed without saving. Note: Using the Close button for checking-in a file only works when the file has not been modified; if the file has been modified the Close button will act as an Check-in button. You are asked to confirm the action. The Delete Files window appears, showing all checked-out files that have been temporarily saved locally, including any versions of the file in a different format. Example: You have opened a JPEG file in Photoshop and have saved a version of the file in Photoshop format. 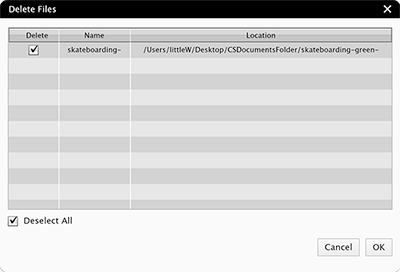 The Delete Files window will now show the files in both formats. Step 6. Clear the check boxes for those files that you do not want to have deleted. The file is made available for other users to edit it and the files that have been selected in the Delete File window are deleted from the local system. Caution: This will automatically delete locally stored versions of the file. Use this option with care. Note: Using the Close button for silently performing an Abort Check-out action only works when the file has not been modified; if the file has been modified the Close button will act as a Check-in button. The file is made available for other users to edit it and the files that have been selected in the Delete File window are automatically deleted from the local system. 13 March 2019: Added section 'Requirements'. 13 March 2019: Updated section 'Requirements' with information about Adobe InDesign CC 2018 and 2019.